Thank you for your May 16, 2014, letter to the Occupational Health and Safety Administration's (OSHA) Directorate of Enforcement Programs with your question regarding OSHA's Hazard Communication standard (HCS 2012), 29 CFR 1910.1200, which was revised in March 2012. This letter constitutes OSHA's interpretation only of the requirements discussed and may not be applicable to any question not delineated within your original correspondence. For clarification, your specific question is paraphrased below, followed by OSHA's response. Background: In your letter, you stated that your company is converting your safety data sheets and product labels to comply with the formatting requirements specified in HCS 2012 . However, the exact placement of the six required elements for labels on shipping containers is not specified by the HCS 2012 paragraph 1910.1200(f)(1). The only provision that specifies a location is paragraph 1910.1200(f)(3), which requires that the elements provided under paragraphs (f)(1)(ii) signal word, (f)(1)(iii) hazard statement(s), and (f)(1)(iv) pictogram(s) be located "together " on the label. You also provided two sample product containers with labels to see if they meet the requirements of HCS 2012. The format used for these labels included the required six elements, with grouping together of the signal word, hazard statement(s), and pictogram(s) on each product label. One sample container was a 12-ounce flattened bottle with a label on its front and a second label with additional information on the back of the bottle. The front label contained general product information, including the (f)(1)(i) product identifier, (f)(1)(ii) signal word, (f)(1)(iii) hazard statement(s), and (f)(1)(iv) pictogram(s), located together. The remainder of the required information for HCS 2012 , specifically the (f)(1)(v) precautionary statement(s), and (f)(1)(vi) name, address, and telephone number of the chemical manufacturer, importer, or other responsible party, was printed on the back label. The other sample container was a 19-ounce cylindrical aerosol can with a single label around its entire circumference. The front view of the can's label contained general product information, along with a product identifier, signal word, hazard statement(s), and pictogram(s), located together. The remainder of the required information for HCS 2012 , specifically the precautionary statement(s), name, address, and telephone number of the chemical manufacturer, importer, or other responsible party, was printed on the remainder of the label and viewed as the can is rotated. Question: What is the correct grouping/placement of the six required elements for labels on shipping containers (product identifier, signal word, hazard statements, pictograms, precautionary statement, and name/address of the manufacturer), per 1910.1200(f)? Must all six elements appear in the same field of view? Do our sample containers with updated labels comply with HCS 2012 ? The chemical manufacturer, importer, or distributor shall ensure that the information provided under paragraphs (f)(1)(ii) through (iv) of this section is located together on the label, tag, or mark. Thus, HCS 2012 does not require all six elements in the same field of view, just the three elements: signal word, hazard statement(s), and pictogram(s). 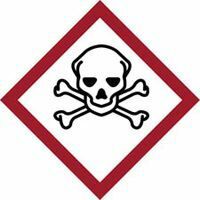 The sample labels which you provided satisfy the HCS 2012 requirement specified in 1910.1200(f)(3) because each label has the (f)(1)(ii) signal word, (f)(1)(iii) hazard statement(s), and (f)(1)(iv) pictogram(s) grouped together in the same field of view. For products that are sold in small sizes, the containers may be labeled using fold-back labels, pull-out labels, tags or other methods. Further, we refer you to OSHA's Letter of Interpretation to Dr. Robert L. Watters, Jr., dated June 4, 2013, which explains practical accommodations for manufacturers unable to use pull-out labels, fold-back labels, or tags containing the full HCS 2012-required information. Thank you for your interest in occupational safety and health. We hope this provides the clarification you were seeking. OSHA requirements are set by statute, standards and regulations. Our interpretation letters explain these requirements and how they apply to particular circumstances, but they cannot create additional employer obligations. This letter constitutes OSHA's interpretation of the requirements discussed. Note that our enforcement guidance may be affected by changes to OSHA rules. Also, from time to time we update our guidance in response to new information. To keep apprised of such developments, you can consult OSHA's website at www.osha.gov. If you have any further questions, please feel free to contact the Office of Health Enforcement at 202-693-2190.